These are truly exceptional recordings that composers and soundtrack producers will get endless mileage out of. Stellar sound quality. Realistic. Easy to play. 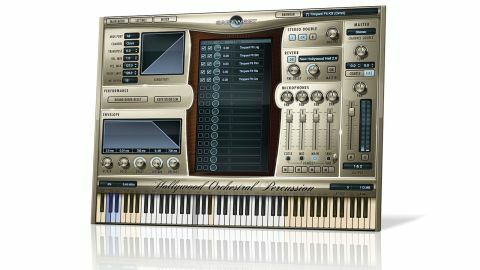 Hollywood Orchestral Percussion Gold includes an extensive array of timpani, snare drums, cymbals, bells, wooden, tuned and other percussion, presented in EastWest's very capable Play ROMpler engine/interface. "The numerous articulations make all of the instruments very easy to negotiate and play"
At 10GB, the Gold version of HOP is 65GB smaller than the full-on Platinum edition, which includes four more mic channels. Given that Platinum comes in at only €80 more, we'd suggest it actually represents the better value of the two, making Gold's comparatively inflexible soundstage feel rather pricey. Eight-way round robin playback keeps things sounding realistic, and the numerous articulations make all of the instruments very easy to negotiate and play. The timpani, marimba and 'Brake Drum and Anvils' presets are particular highlights, but there's nothing here that lets the side down. These are truly exceptional recordings that composers and soundtrack producers will get endless mileage out of.